About 14,000 people are dying prematurely every year in South Korea as a result of air pollution, a medical professor said Monday, citing a report by the US-based Institute for Health Metrics and Evaluation. 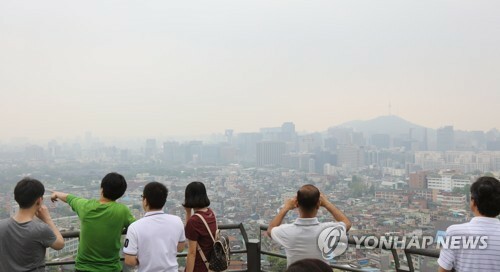 Cheong Hae-kwan, a professor at the Medical College of Seoul's Sungkyunkwan University, said during a seminar that the number of premature deaths in South Korea caused by air pollution was tallied at 13,703 in 2013 in the IHME report. The figure translates into 4.5 percent of the country's entire deaths in the reported year or one every 20 deaths per year resulting from polluted air. The main culprit was the emission of dangerous air particles, known as PM2.5, which was responsible for 12,037 deaths comprising 4,274 deaths from lung cancer, 1,901 ones from ischemic heart disease and 5,862 ones from cerebral stroke. The number of people who died of chronic obstructive pulmonary disease or asthma after being exposed to ozone was estimated at 1,666 at rest. Cheong also cited the projection of the Organization for Economic Cooperation and Development that South Korea could top the group of developed market economies with premature deaths from air pollution in the next 40 years.